They contain high amounts of folate (a water-soluble B vitamin – folic acid is the synthetic form) and betaine, two nutrients that lower your blood levels of homocysteine, an inflammatory compound that damages arteries and increases your risk of heart disease. Beets are full of soluble fibers that reduce triglycerides, increase your levels of good cholesterol (HDL), and strip away excess bad cholesterol (LDL) protecting your heart from potential heart attacks and strokes. The high amounts of potassium in beets help dilate your blood vessels, lowering your blood pressure throughout your body. The copper found in beets make it’s iron content more readily available to your body so it can efficiently regenerate red blood cells and improve cellular respiration that kills cancer cells and eliminates waste products. In addition, beets are an excellent source of carotenoids and flavonoids (types of phytochemicals found in colorful plant pigments). These potent antioxidants block the formation of carcinogens and may suppress cancer development. Betacyanin, the pigment that gives beets their wonderful crimson color, has been proven to slow the growth of tumors by 12.5 percent in patients with prostate and breast cancer. It also helps your liver in the detoxification process in eliminating harmful toxins. Beets are delicious when served roasted or in a salad, but if you want to get the most nutrients out of your meal, skip the cooking process and eat them raw. Juice them into your daily veggie drink, grate them into your salad, or slice them thin and dip in Hummus or Vegan ‘Ranch’ Dressing. Don’t just serve the beetroot. Their leaves and stems are even more nutritious when cooked; include them in your sautéed greens or stir-fries. Golden Beets have a carrot orange color with a mild flavor and thin skins that do not require peeling. Chioggia is a hybrid heirloom Italian beet with red and white bulls-eye. Cylindra is a hybrid beet that grown long and thin like a potato. Detroit Dark Red is the common variety you find in grocery stores. Gladiator is a popular red beet used for canning. Sugar Beets are white, sweet and much larger then ordinary garden beets. The are grown specifically for processing into sugar. Yellow Detroit starts out orange but turns yellow when cooked and has mild flavor with thin skins that do not require peeling. 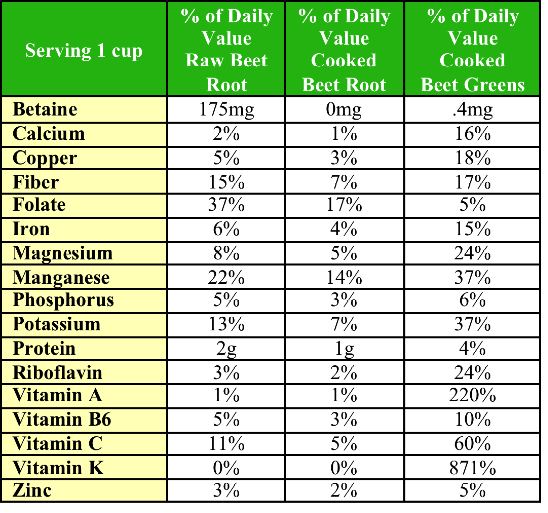 Beware of beeturia: It’s always a good idea to consume beets in moderation. If you drink or eat too much your urine and stools will turn a pink to red color. Nutrient absorption: Add lemon juice to your beets before serving to enhance nutrient absorption. 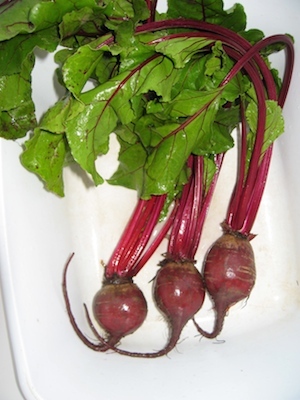 Cleaning beet stains: The red dye of beets is water-soluble. To remove from hands and cutting boards, rub with lemon juice and salt before using soap. This entry was posted in grocery shopping, Nutrition, Plant-based, Recipes, Vegan, Whole food and tagged anti-cancer, beets, cancer fighting foods, eating for health, healing with beets, health, healthy eating, Nutrition, Vegan. Bookmark the permalink. I love me some beets!! Yum!